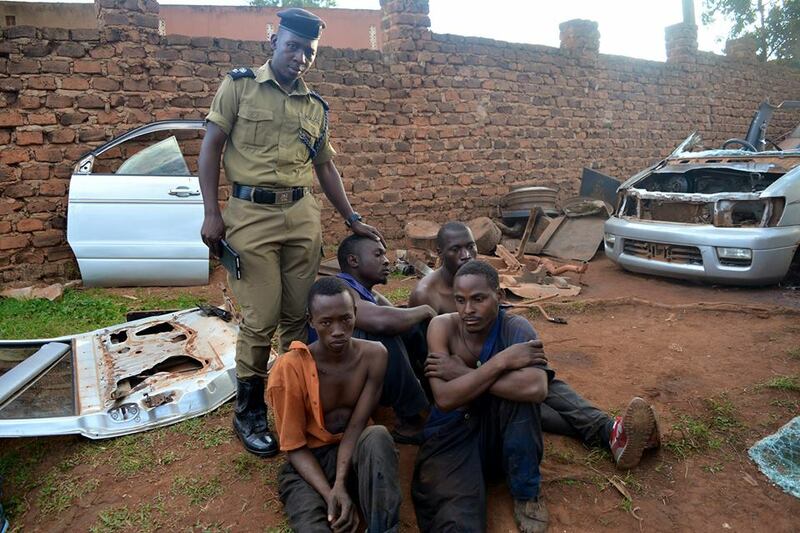 NANSANA – Kampala Police on Monday 10, raided a rented parking yard in Nansana, arresting five for allegedly stealing, dismantling and selling motor vehicles to scrap dealers. The arrested suspects are; Joseph Magoba, Willy Kizza, Gregory Luyinda, Henry Matovu and Mustafah Kayondo who were picked from a rented parking yard located at the premises of Daliya Bembe. In an operation led by Nansana Police chief SP. Benard Katwalo, the raid on the premises was intelligence reports emerged over suspected illegal activities conducted in the parking yard. “Four of the suspects were caught red handed dismantling a Toyota Noah car registration number UAR 157N,” police said on Monday. During the same raid, the police also recovered a Toyota Premio UAK 982B, already dismantled. According to police, the recovered vehicle was reported missing on Wednesday August 29 this year by a one Mr. Joshua Lubega Babulira who had reported the case CPS Kampala vide SD REF. 12/29/08/2018. “A number of car accessories including brand new tyres, Mark II windscreens engraved with a registration number (UAF 325K), radio systems were recovered during the search,” police revealed adding that they also discovered an isolated burning ground where the non-profitable vehicle parts like sponges, wires were suspected wasted into ashes to avoid any possible evidence. According to police, the suspects also revealed that they dismantle vehicles instead of re-selling them in order to avoid being detected, tracked and arrested by the police. The suspects are currently detained at Nansana Police Station pending charges on various cases including stealing of motor vehicles, aggravated robbery among others.